A person vapes using a Juul. A commentary published in September by NU researchers says electronic cigarettes like Juul should be viewed as separate products from regular cigarettes. Electronic cigarettes should be seen as a unique tobacco product rather than another type of cigarette, a research commentary co-authored by Northwestern researchers says. The commentary examined different studies of electronic cigarettes to better understand how researchers have been discussing the devices, and what substantial differences emerge between e-cigarettes and regular ones. Published September 28 in Nicotine & Tobacco Research, the article aims to provide a fresh perspective on e-cigarettes and improve how researchers view them. The original idea for the commentary came from Olonoff during his time working in professor Brian Hitsman’s Nicotine Dependence and Treatment Lab. According to Hitsman, Olonoff came into Feinberg with an interest in studying non-combustible nicotine and tobacco use, when the lab primarily studied combustible nicotine products. He began working on a master’s thesis about e-cigarette use among racial and ethnic minority college students, and developed ideas from his studies that led to this paper. The two began working on the commentary, eventually bringing in New York University professor Raymond Niaura — who Hitsman had previously worked with due to his knowledge and expertise in e-cigarette research. “(Olonoff has) had some really great ideas about how the field needs to move in a certain direction in order to improve our understanding of e-cigarette use,” Hitsman said. One of the main differences between vapes and regular cigarettes, Olonoff said, is right in the name: because users vape a liquid rather than combusting nicotine, its effects differ. Another major distinction is that e-cigarettes can vary in the size of their nicotine containers, so the nicotine dosage often varies from vape to vape. E-cigarettes and regular cigarettes also differ in the way people smoke them. Users can smoke one or two puffs of an e-cigarette at a time, allowing prolonged usage throughout the day. This change can have significant implications on a user’s health. “Rather than looking at how people might get sick, we may start looking at how smokers switching to these products actually have been better in terms of lung function, coughing, things like that,” he said. Despite having less consequential health setbacks, e-cigarettes have come under recent scrutiny for getting teenagers hooked. Each researcher said the prevalence of e-cigarettes among high school and college-aged demographics is alarming, especially as the e-cigarette Juul becomes increasingly popular among the demographic. Younger audiences, Olonoff said, often have less exposure to other forms of tobacco and nicotine products, making it easier to get hooked. 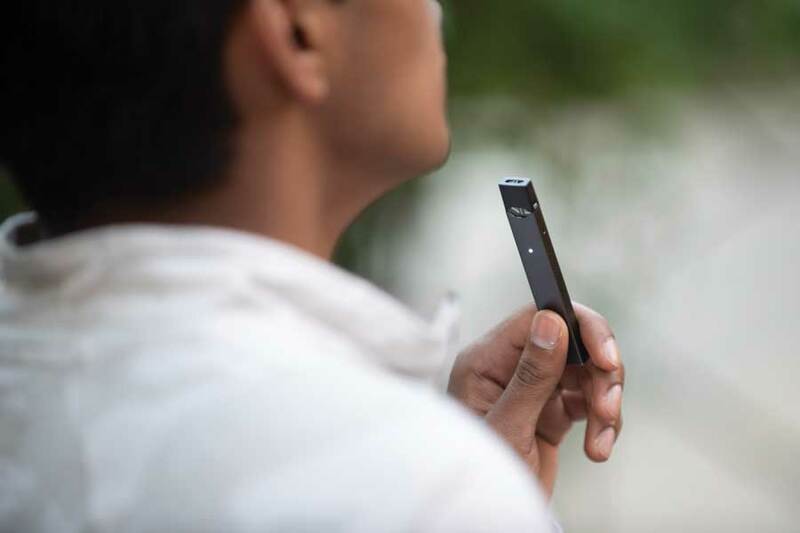 Niaura added that Juul can be attractive to students for several reasons, including its design, portability and small-size. Hitsman agreed that e-cigarettes are almost certainly safer than regular cigarettes, but said their health effects are still largely a mystery to researchers. “In a way we’re kind of having to start over a little bit, trying to find out what dependence is like for people with e-cigarettes,” he said.